JUPITER’s range of options and versions makes it the most innovative machine on the market, featuring high-performance, flexibility and unique features. JUPITER has a double clamping system that allows simultaneous drilling and filling of brush blocks at the same time, ensuring the maximum productivity. The 5 axes of motion give the highest degree of tufting flexibility with infinite combinations of filling angles. JUPITER is available with standard mechanical filling head or e-STROKE filling head. The e-STROKE version allows to adjust the stroke of the machine at a variety of speeds, maximizing production speed (RPM) based upon fiber length in the brush. Cylinder brushes, disc brushes and lag brushes: ability to produce all the most diffused technical and industrial articles. Fiber feeding system: stock box for synthetic filament (up to 3 colors) as well as natural, animal, metal and grit fiber. Big size brushes: cylinder brushes up to 4000mm length and discs up to 900mm diameter. 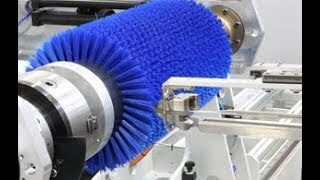 * Data for cylinder brushes up to 2000 mm. Weight and dimensions depend on the maximum length of the brushes to be produced.